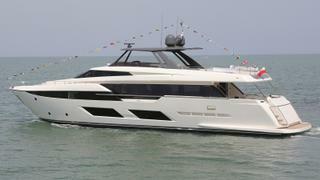 Italian yard Ferretti Group has launched the first hull in its new Ferretti 920 range of 28.49 metre maxi flybridge yachts. Developed in collaboration with Zuccon International Project and set for a public debut in September at the 2017 Cannes Yachting Festival, this fast planing yacht was built from a GRP hull and superstructure to RINA classification. Key features include a raised bow design that allows for a wider main-deck owner’s cabin, as well as adding to the imposing and aggressive appearance of the yacht on the water. 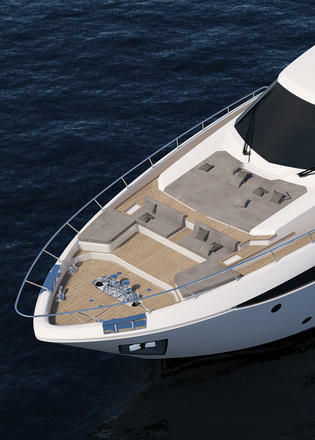 Ferretti Group adds that the foredeck seating area on the 920 is the largest it has ever created for a yacht of this size, with two sofas, a coffee table and removable sun shades. Moving aft and the swim platform has been fitted with a submersible hatch, which allows for easier tender launches and creates a beach club area when the smaller vessel is deployed. The cockpit will be made available in a choice of two layouts, with owners able to choose between a chaise longue or a sofa in this area. The flexible superyacht sundeck includes freestanding furniture and a choice of convertible Bimini options, from variable louvres to tinted glass. 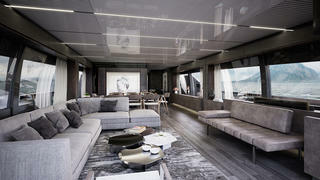 Interior décor is reminiscent of the recently launched Ferretti 850 series — recessed ceiling light and panoramic windows will create the impression of a floating penthouse. Accommodation is for 8-10 guests with a choice of two lower-deck layouts, while the crew quarters allow for a staff of up to five people. Power comes from a pair of MTU diesel engines — those who choose the most powerful twin 2,435hp set-up will be table to enjoy a sporty top speed of 30 knots. Other optional extras include zero-speed fins stabilisers or a Seakeeper stabilisation system. The yard adds that the second Ferretti 920 is being built for the American market and will make its debut at the 2018 Yacht Miami Beach boat show, which the third model in the series will head to Asia as part of the yard's bicentenary celebrations. 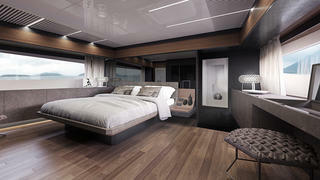 Stefano de Vivo, chief commercial officer of the Ferretti Group, added: "We are sure that this new model will attract a great deal of interest in Europe and the United States, where it will be presented in the coming months and help to get a landmark year for the brand underway."